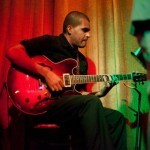 Alvin Castro Jr. has been a professional musician and educator for the past eight years. Being a Southern California native, he has been playing guitar since the age of 6 and has always had a passion and interest in music. He received his academic training at Azusa Pacific University; he obtained a Bachelor’s of Arts in Guitar Performance and Music Education as well as a Master of Music degree emphasizing in jazz and classical guitar performance. Al’s job experience includes classroom teaching, private instruction, being a member of a 7-piece jazz band and playing for a variety of events such as weddings, musicals, dinner banquets and church services. Al is currently attending Citrus College to pursue a certificate in Recording Arts and plans to continue to grow as a working musician. Christopher Parkening, John Williams (the guitarist), Larry Carlton, John Scofield, Mike Stern, and Paul Jackson Jr.
Let others know about Al's Guitar Lessons. Did this teacher help you to learn? How long did you take lessons? Are you still playing music? Share any thoughts or stories you have so that others can know about this teacher!